Specimen without signatures print "SPECIMEN" UNC about 36,000 baht. 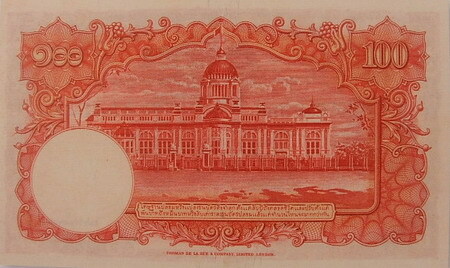 The 9th series 100 baht type 4 banknote is identical to the 100 baht type 3 banknote. But the watermark image was chaged to the portrait of King Rama 9. Even though each type of 100 baht 9th series banknote is quite similar, the different points of the 100 baht type 4 banknote are the portrait of King Rama 9 in older of age and the serial number that is printed in black color as well as a security thread. And the watermake image is the portrait of King Rama 9. 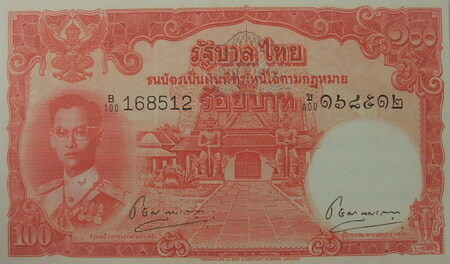 The 100 baht type 4 banknotes were announced on 13th January 1959. The main object is the image of King Rama 9 in older age in the uniform of the supreme. The middle image is the crown-top gate at temple of dawn. The serial number is printed in black color. There is a security thread. And the watermake image is the portrait of King Rama 9.